Versailles senior Kelsey Custenborder recently signed her letter of intent to continue playing volleyball at Heidelberg University. Kelsey (seated in center) is pictured with her parents Pat Custenborder (left) and Kim Custenborder (right). Standing (left to right) are Versailles head volleyball coach Kenzie Bruggeman and varsity assistant coach Liz McNeilan. VERSAILLES – The choice came down to three schools for Versailles senior Kelsey Custenborder. In the end, she chose the one where she felt most at home. 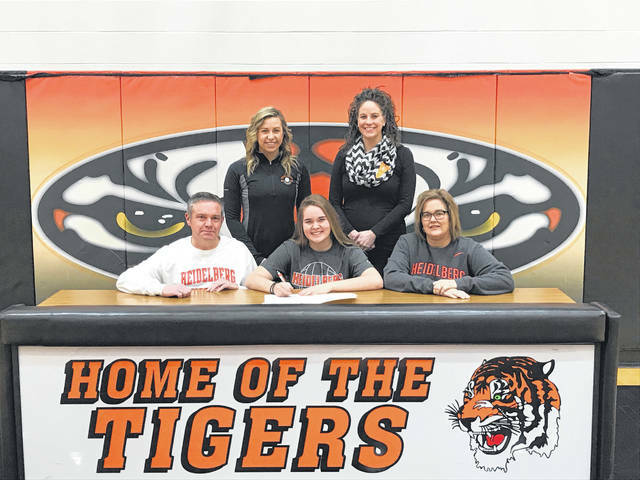 Custenborder will continue playing volleyball at Heidelberg University. Heidelberg is an NCAA Division III school that competes in the Ohio Athletic Conference and is located in Tiffin, Ohio. The volleyball program has experienced recent success having winning records in each of the last four years including trips to the NCAA Division III regional tournament in both 2015 and 2016. The Student Princes also were the OAC tournament champions in 2015. Custenborder is no stranger to success on the volleyball court, as well as on the basketball court. She helped lead the Lady Tigers to a second straight Division III state volleyball championship back in November, and was a varsity player with last year’s Division III state runner-up girls basketball team. She is currently in basketball season with the Lady Tigers where she is averaging 7.0 points, 3.8 rebounds and 2.3 assists per game. In her senior volleyball season, Custenborder led all of Darke County with 762 assists. She also had 158 digs, 28 kills, 27 blocks and 24 ace serves. Custenborder said she believes she will be a good fit at Heidelberg. Custenborder visited both Bluffton University and Thomas More College before deciding on Heidelberg. “I had it narrowed down to those three, but when I went on campus at Heidelberg it just felt right,” Custenborder said. “It felt like home. It was a hard choice because Thomas More is where my parents went. That is where they met, but it just felt right when I was at Heidelberg and they have a great business program and business administration is what I am studying. Custenborder said she is unsure what she wants to do with the business administration degree at this point, but is leaning toward either insurance sale or marketing.